It’s always nice to see when technology takes a cue from nature. In this case, the Bloom Light. 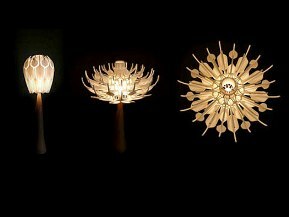 The Bloom Light is the creation of Patrick Jouin. It is merely a concept for now, but it could very easily be something that I would put in my reading room. This would be assuming that I have a reading room, which I do not. As you can see, it is something that looks like an ordinary bulb, at least at the beginning. And by the word “bulb”, I mean something like a flower bud. I think “bud” is probably the best explanation as the light blooms like a flower. This allows the light to be spread out amongst the room, and I’m guessing that it makes some pretty patterns. Maybe if it spins, it can become something like a disco chandelier. It sort of reminds me of the “primary weapons” on the big honkin’ motherships in Independence Day. I suppose that if the Bloom Light was a chandelier, I might get nervous that it was going to incinerate me. Still, I like this design, and would love to have it on my ceiling or post lamp. It is not for sale now, but it will be on display at the International Furniture Fair in Milan.